250 pages | 15 B/W Illus. Underwater Cultural Heritage investigates cases of underwater cultural heritage, exploring ethical issues that have never been studied before. A vast cultural heritage lies beneath the sea, including the archaeological remains of more than three million vessels, as well as historic monuments and whole cities. In addition, climate change, population growth and current events around the world mean that new underwater cultural heritage is being created faster than ever before. It is, therefore, essential that the ethical issues related to the management of such heritage are considered now, especially as decisions made now will bestow the heritage with a value and will establish legal frameworks that could be used either to protect or harm underwater heritage in the future. 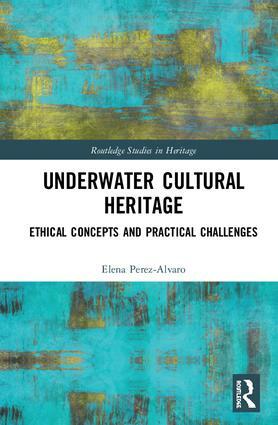 Considering a range of challenges related to underwater cultural heritage - including preservation, management, use, sustainability, valuation, politics, identity, human rights, and intangible heritage - the book presents case studies that both illustrate the key ethical issues and also offer possible solutions to help navigate such challenges. The book will also explore the various legislative instruments protecting underwater cultural heritage and emphasise the importance of revising and updating legal frameworks, whilst also taking into account ethical concerns that may expose cultural heritage to more serious menaces. Underwater Cultural Heritage draws on case studies from around the globe and, as such, should be of great interest to academics, researchers and students working in heritage studies, archaeology, history, politics and sustainability. It should also be appealing to heritage practitioners and policymakers who want to learn more about the issues surrounding not only management of underwater cultural heritage but management of cultural heritage in general. Elena Perez-Alvaro holds a PhD in Cultural Heritage from the University of Birmingham, UK, and an LLM in Maritime and International Law from University of London, UK. She is the founder and Managing Director of the consulting firm Licit Cultural Heritage.